How much does it cost to travel to Sucre? How much money will you need in Sucre? $b156 ($23) is the average daily price for traveling in Sucre. The average price of food for one day is $b77 ($11). The average price of a hotel for a couple is $b91 ($13). Additional pricing is in the table below. These average travel prices have been collected from other travelers to help you plan your own travel budget. How much money do I need for Sucre? 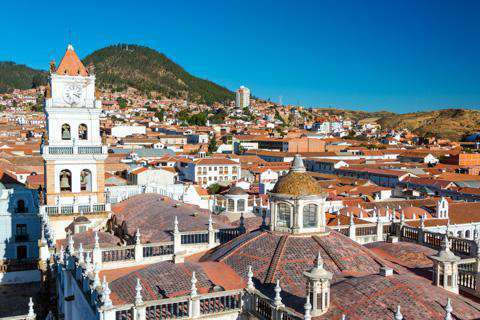 Sucre is famous for its gorgeous town center and delightful climate, making it for many Bolivia&apos;s most beautiful city. Also considered the symbolic heart of the nation, &apos;La ciudad blanca&apos; or the white city has preserved stunning whitewashed buildings sheltering pretty patios and other beauties of colonial architecture. The city was declared a UNESCO World Heritage site in 1991 and is under strict controls on development. It offers many attractions including historic buildings and a renowned theatre, but you can also wander around prehistoric sites and discover indigenous culture in the surrounding towns and countryside. Tourists love Sucre for its relaxed atmosphere. It's definitely on the list of top places to visit in Bolivia. Plaza 25 de Mayo is Sucre&apos;s central hub and one of the prettiest plazas in Bolivia, perfect to relax and admire the surroundings. Around you will find the seat of the Roman Catholic Church in Bolivia, the Metropolitan Cathedral of Sucre. The Cathedral is of great importance to the deeply religious city and is open to the public from 10h to 12h and 14h to 17h, Monday to Friday. Visit one of Sucre&apos;s many colourful and bustling markets for a unique experience of local culture. Check out Sucre&apos;s cemetery for a rather unusual peaceful hideaway. Inhabitants of Sucre go there to read a book, catch up with friends or simply to contemplate life. Visit El Castillo de La Glorieta, which is part of a Bolivian tale about a prince and princess and their pink, crazy, fairy-tale castle they built on the outskirts of Sucre. Go to La Recoleta, at the bottom of the Churuquella Mountain, for a peaceful lookout point with some of the best panoramic views over Sucre. Visitors to Sucre will usually find that they spend the majority of their time within a few blocks of the central square. However, if you have time and you are willing to explore a little further, there are many other interesting places to visit such as Avenida de las Americas, a wide, imposing two-laned avenue running North to South and decorated with manicured gardens, statues to celebrate some of Sucre&apos;s political figures, dinosaur telephone boxes, many benches and a big flower clock. Sucre provides visitors the chance to learn about the country&apos;s cultural, artistic and religious history in some of the countries&apos; best museums and galleries. Most of the museums are conveniently located in the city&apos;s center within walking distance from the main plaza. One of Sucre&apos;s most famous tourist attractions is Espacio Cultural Origenes&apos; folkloric show and dinner spectacular. The restaurant is set around a large stage where, almost every night of the week, they put on a colorful, high-energy dance show featuring traditional dances from Sucre and the rest of Bolivia. A fabulous way to explore Sucre&apos;s stunning and diverse countryside is to trek from Sucre to the Maragua Crater. During the trek you will see some breathtaking Bolivian scenery, discover the local flora and fauna, see dinosaur footprints and share the traditions of a local Quechuan family. For dinosaur-lovers, visit Sucre&apos;s Dinosaur Park and Footprints (Parque Cretacico), where you will see 5055 perfectly preserved dinosaur footprints from about 15 species of dinosaur. Food is a unique part of the culture in Bolivia. Dishes come from a blend of Spanish cuisine with ancient Andean traditions. Bolivia has many geographical zones, which means that local ingredients often vary from region to region. For example, the Papas Rellenas (stuffed potatoes, usually with a boiled egg, cheese and spices) is a dish originally from Peru, which has been adopted and adapted throughout the Bolivian Andes. The typical dish of Sucre is the Mondongo, which consists of crispy fried pork with a bit of the skin accompanied by corn, potatoes and a chili sauce. Finally, do not miss the Saltenas, a popular snack found all over the Andean half of Bolivia. There are a few options of airlines available when traveling from South America to Sucre’s small airport, including Amazonas, Boliviana, EcoJet and TAM. The bus terminal is about 2 kilometers from the city center. There is a bus waiting right outside the airport that takes you to the center of the city in just 40 minutes for 8 bolivianos (USD$1.15). Otherwise you can share a taxi to the centre for 5 Bolivianos (USD$0.75) per person. If you are not comfortable sharing a taxi, you should make this clear to the driven beforehand. Sucre is a small town with regular hop-on buses and plenty of taxis. A tourist bus or private transport is needed to visit some of the attractions outside of Sucre, such as Tarabuco market and the dinosaur footprints.